Many of the scams are variations on a particular theme and have been around for years. One of the oldest scams is ‘Find the Lady’ or ‘cup and ball’ where you are invited to bet on where the ball is located under three cups. A recent case involving City of London Police suggest there are still scamsters trying this on London bridges. Two men were charged under section 33 of the Gambling Act on Sunday 15 March after off-duty City of London Police officer Insp Harley witnessed a group of men undertaking a ‘cup and ball’ game on Tower Bridge. 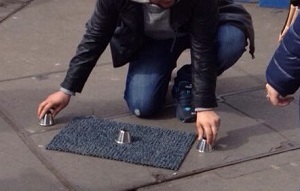 The game works by the gang targeting tourists to get them to try and predict which cup the plastic ball will be under. Community Policing Insp Harley witnessed suspects encouraging members of the public to participate in playing the game. This is done to entice unsuspecting members of the public to gamble money with no chance of winning. City of London Police Inspector Harley said “These games are not a matter of chance, but are fixed to ensure members of the public do not win. It pays to be extra vigilant on bridges which are often considered safe ground by many beggars, scamsters and musicians because they do not seem to fall within any local authorities jurisdiction, however they are patrolled by police and if you spot suspicious activity, report it to a uniformed police officer. If you come across suspicious activity, report it to a uniformed officer in the street or in a police station. 101 is the Non emergency number to call when you want to contact your local police in England, Wales, Scotland or Northern Ireland – when it’s less urgent than a 999 call. Non emergency usually include: Stolen car, Laptop, Smartphones and mobile phone, Minor traffic collision , Property damage, Drug dealing. By londonvisitors2014 in Security on April 11, 2015 .